Headlies: The Club Get Their Own Clubhouse - WrestleCrap - The Very Worst of Pro Wrestling! Cincinnati, OH – Now that they have established themselves as a force to be reckoned with in the WWE, The Club have decided it is time to open an official clubhouse. Suddenly, a knock came from the clubhouse’s secret door. “That’s not the special knock!” shouted Anderson. “Come on guys, you know it’s me!” implored AJ Styles. “What’s the password?” giggled Gallows. “Oh, man. It’s…it’s…wait, I got it. ‘Boys rule, girls drool!’” said AJ. Anderson opened the secret door and the trio partied late into the early evening. 14 Responses to "Headlies: The Club Get Their Own Clubhouse"
The Club Clubhouse is located right next door to the Aces and Eights’ clubhouse. 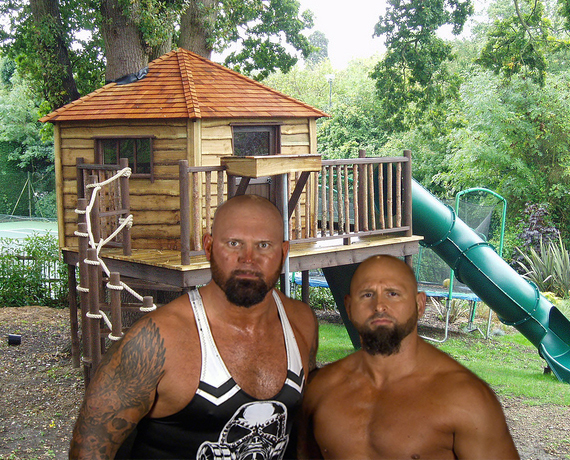 Wait… or did Gallows’ dad just buy the old Aces & 8’s clubhouse and move it to his backyard??? “Late into the early evening” may be the best one liner in WrestleCrap history. The password would have to be, Beat up John Cena. In a fit of jealousy Roman Reigns would start his own clubhouse. Unfortunately, even after voting himself Clubhouse President he did not allow himself to join the club. He was last seen knocking on the cardboard box cool kid clubhouse gang of The Hype Bros. They pretended to not be in there even though you could see the box shaking as they tried to stifle their giggles. Gushers do indeed rule. That is all. Gay Popeye is that you? Toot!!! Toot!!! Clubhouse Mantra (much like the Moose Lodge mantra): “I’m a man but I can change. If I have to. But in the process of doing so, we must beat up John Cena. Oh and CAV’s RULE!” Go Labron! (this last part was added by Styles. Gallows and Anderson simply looked at him. Styles shrugged and was like: what? I like Labron James. Gallows then went to the corner to stifle his giggles and Anderson snatched the gushers out of Styles hands and attempted to eat them all up while trying to stay away from an indignant Styles. Not “Moose Lodge” — “Possum Lodge” (_The Red Green Show_). Seriously, I’d start watching WWE again regularly if they actually did skits like this. They should revive WWE Saturday Morning Slam and make “The Club Clubhouse” a regular skit on the show!